Assam CM Sarbananda Sonowal lighting a lamp at the launching ceremony in Guwahati on Thursday. 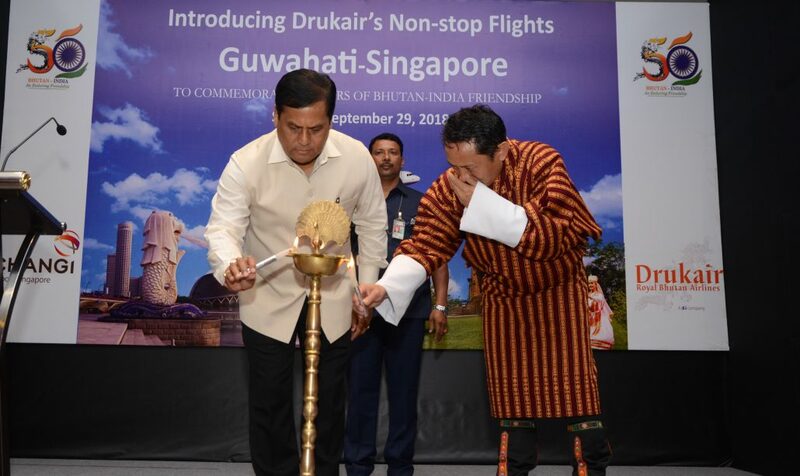 Assam Chief Minister Sarbananda Sonowal said diplomatic relations between India and Bhutan would receive a boost with the launch of new flight by Drukair-Royal Bhutan Airlines connecting Guwahati with Singapore. Drukair-Royal Bhutan Airlines is the flag carrier Bhutan headquartered in Paro. Sonowal said this while taking part at the ceremonial launch in Guwahati on Thursday of this new international service whose inaugural flight between Guwahati and Singapore will take off on September 1 next from LGBI Airport, Guwahati. He said that the initiative would not only facilitate trade and people to people contact among Bhutan, Assam and Singapore but also contribute towards strengthening social, cultural and economic ties. Terming the initiative as historic, Chief Minister Sonowal expressed his deep appreciation to the Royal Government of Bhutan and Drukair-Royal Bhutan Airlines for the endeavour to connect Guwahati directly with Singapore. Extolling the deep rooted relationship between India and Bhutan, Sonowal said the new initiative in aviation sector would give a major fillip to diplomatic relations between the two nations. He said the linkages between the two countries have deep historical and civilization roots, going back to several centuries. “Bhutan has always been our most exotic and resourceful neighbour with its unique and vibrant ethnicity and is known for promoting peace and human values,” Sonowal added. Karma Tsheltrim, Advisor to the Interim Government, Ministry of Economic Affairs of Royal Government of Bhutan, Assam Industry and Commerce Minister Chandra Mohan Patowary, Forest Minister Parimal Suklabaidya, Kesang Wangdi, Ambassador, Royal Bhutanese Consulate General, Guwahati, senior dignitaries of the Royal Government of Bhutan and Drukair Corporation Limited and senior officials of Government of Assam, Airport Authority of India and major travel agents were present in the launching ceremony. During the inauguration of Royal Bhutanese Consulate General in Guwahati on February 2 this year, Foreign Minister of Royal Government of Bhutan Damcho Dorji announced this flight and within a couple of months this has become a reality marking a new beginning in air connectivity in the region.